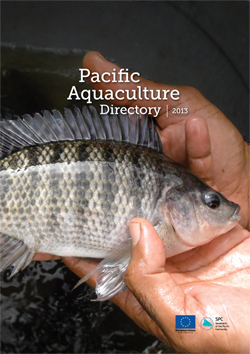 Author: Avinash Singh, IACT Aquaculture Officer. 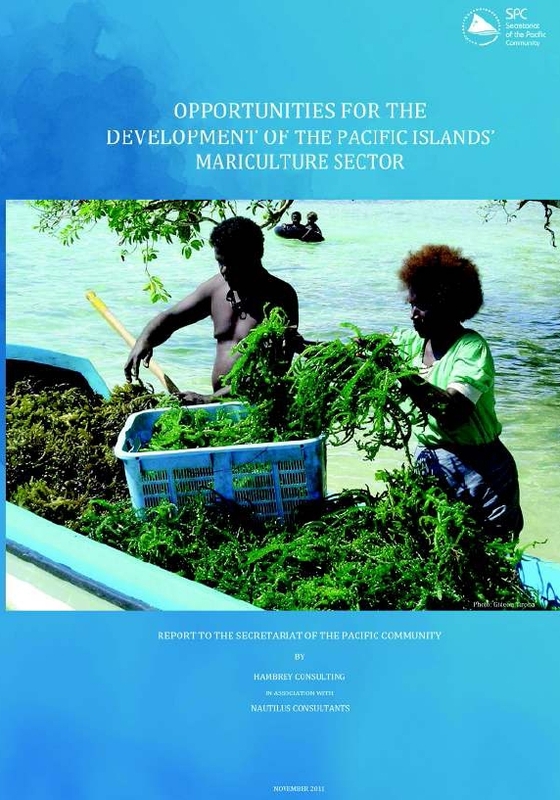 Opportunities for the development of the Pacific Islands Mariculture Sectorhot! 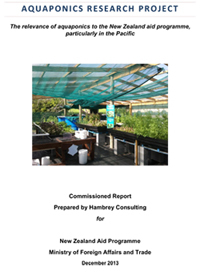 This overview report addresses opportunities for the development of the Pacific Islands’ mariculture sector in general terms. More specific analysis of opportunity in particular countries is presented in the five accompanying country reports (Cook Islands, Fiji, Papua New Guinea, Republic of the Marshall Islands and Solomon Islands). 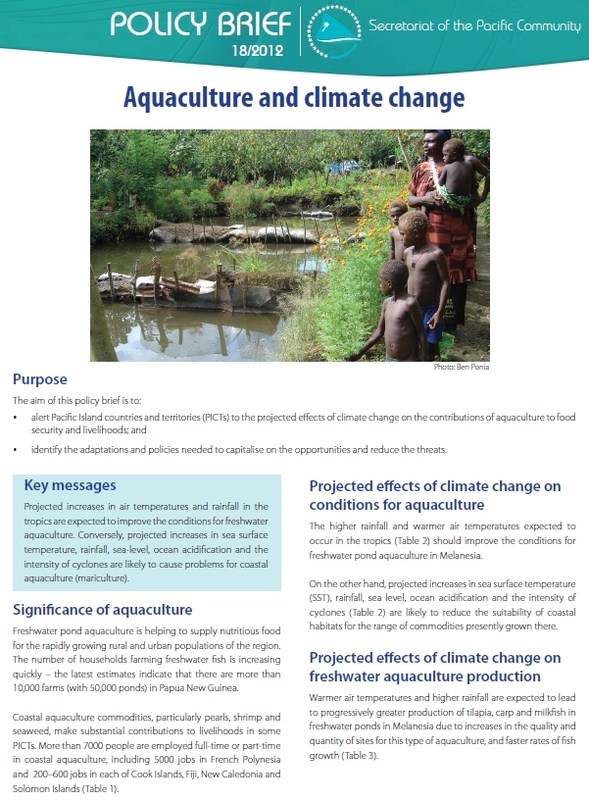 Aquaculture and climate change, Policy briefhot! - Identify the adaptations and policies needed to capitalise on the opportunities and reduce the threats. Pathogen and Ecological Risk Analysis for the introduction of Cobia (Rachycentron canadum) from the hot! 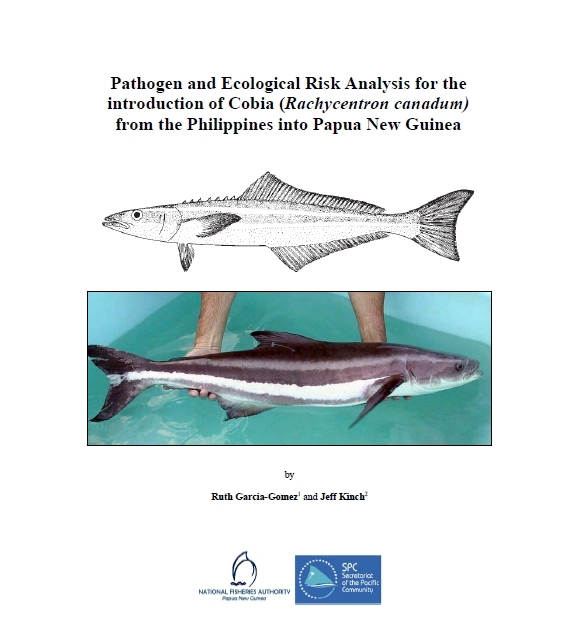 Abstract: The objective of this document is to undertake an Introduction Risk Analysis (IRA) of the potential pathogen-related, ecological, and socio-economic risks associated with the proposed introduction of an improved strain of cobia (Rachycentron canadum) from the Philippines into Papua New Guinea (PNG) for aquaculture development. The proposed location for grow out of cobia is the Kavieng Lagoon in the New Ireland Province and will be undertaken by a private company which is based in Kavieng, with technical and quarantine support from the National Fisheries Authority (NFA) and their Nago Island Mariculture and Research Facility which is located in the Kavieng Lagoon; and the National Agriculture and Quarantine Inspection Authority (NAQIA).